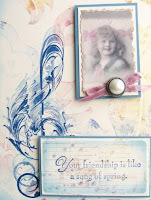 Vada's Blog Stamp Inks and Paper : Song Of Spring. “What am I going to do today?” Needless to say I started out cleaning off my work area when I came across a plastic box of background techniques that I did sometime ago. I remember at the time I was not all that impressed with the “Background Burst Extension Technique”, but thought I would try this again. This background just felt “Springy”, with such light soft pastel colors; I could not resist trying it. My little girl graphic comes from “Artful Illusions” http://www.mrsolearysart.com/ the “Artasia Archives - Little Girls” sheet. I used a second technique on the musical clef called “Depth of Field”. This card contains two techniques. Depth of Field from June 2009. 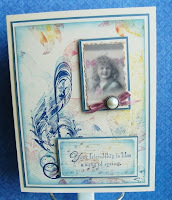 Song of Spring from Stampin’ Up. I love the soft feel of the card and the subtle colours. Very soft and lovely! It's fantastic. Vada, I love that background! Such a pretty card all the way around! Stay warm today! Hugs! LOVE the softness of your card. Really feels like spring!